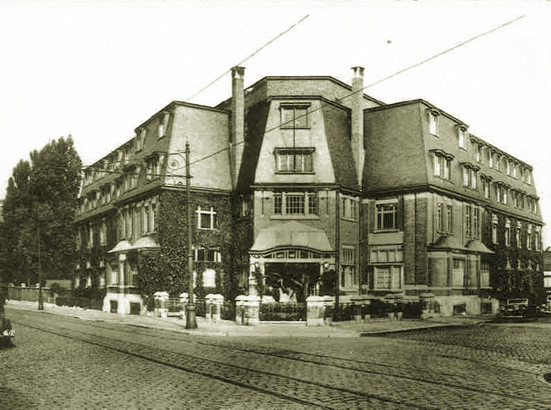 1915: official opening of the hospital with 22 rooms, located between rue de Bruxelles (now rue Edith Cavell) and rue de l'Ecole (now rue Marie Depage) in Uccle. It consists of a central building housing on one hand general services, and on the other hand two wings; one for school and rooms for interns and the other for sick persons. 1918: a surgery room, the foundation of the "California House Ward", is built. 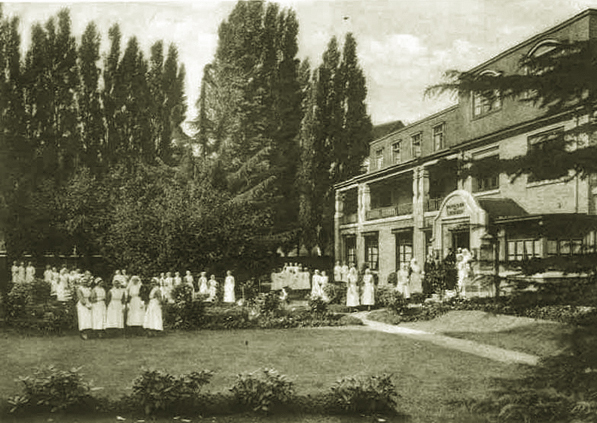 1919: creation of a nursery for 12 children. 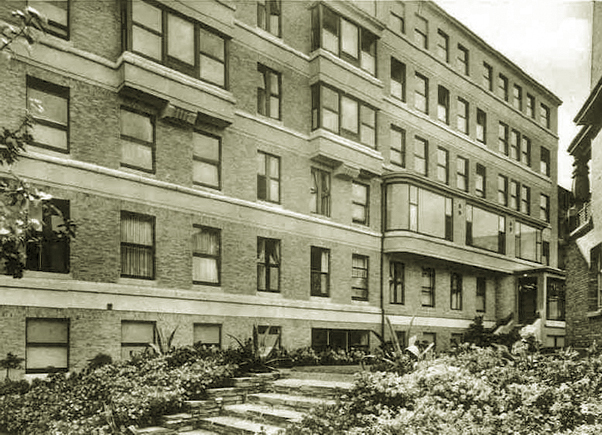 1921: creation of 2 medicine rooms and a room for injured workers, on rue Depage. This is called the shacks. 1922: the Edith Cavell Clinic includes A1 and A2 services and 4 wooden pavilions (the shacks). 1923: creation of the first maternity ward, the very first in Brussels (47 births/year). 1925: opening of the first preliminary school. 1926: construction of the "Pavilion of Chicago." 1930: construction of a health centre in one of the shacks used as a dormitory for students. 1935-36: construction of a second building in hard materials (capacity increased to 120 beds). 1939: inauguration of the Queen Astrid Pavilion. 1952: construction of the Solvay building (capacity increased to 170 beds). 1971: demolition of Building A that became dilapidated. 1974: inauguration of the new building A, the "New Cavell." 1982: the "New Cavell" is in liquidation. The Cavell Depage-school moves to the Red Cross. 1983: the Edith Cavell Medical Institute (ECMI) reopens. merger of the Edith Cavell Clinic with the Lambermont Medical Centre. closure of the Cavell-Depage school. at the ECMI, there are new operating rooms, as well as the rehabilitation of room deliveries, the Day Clinic, and a dialysis service. Several hospitalisation services are redeveloped. 1997: the maternity ward celebrates its 100 000th delivery. 1998: merger of the Basilique Clinic with the Parc Leopold Clinic. 2000: Birth of the CHIREC ASBL and merger with the Braine-l'Alleud – Waterloo Hospital. Located in the municipality of Uccle, in the centre of residential municipalities in the south of Brussels, the site has now 287 beds. We record 14,000 standard hospitalisations, 12,000 surgical or medical day hospitalisations and nearly 3,200 births per year. Over 400 renowned doctors are accredited to it, covering all specialties except cardiac surgery: mother-child pole, orthopaedics, digestive and bariatric surgery, plastic surgery, ophthalmology and many other services have all the medical expertise and the infrastructure needed to provide optimal care to patients. The teams in medical imaging, isotope and radiation therapy as well as the laboratory are all conform to the best standards and quality labels. Not to mention the nursing service and paramedics complementing the global and multidisciplinary care of patients. Its accessibility is ensured by the proximity of means of transport (bus 60 stop Cavell Clinic - Ziekenhuis; trams 3 & 7 stop Churchill, and tram 7 stop Cavell). the CityClinic CHIREC Louise, located in the heart of Ixelles, Avenue Louise 235B. about 14,000 standard hospitalisation (representing 75,000 days). 800 members of staff, mainly nurses. 420 doctors of all specialties. The CHIREC ASBL was founded on the 11th of July 2000. It was born from the successive mergers between Edith Cavell Clinic, Europe-Lambermont Medical Centre, the Parc Leopold Clinic, the Basilique Clinic and the Braine-l'Alleud - Waterloo Hospital. 2006: As part of the strategic plan, the CHIREC decided to consolidate two of its sites in Brussels (Cavell & Parc Leopold) into a single site (Delta). This grouping is more interesting than a renovation of two sites: dilapidated buildings, extensions difficulties because the sites are located in Brussels, wholesale cost of renovations. Moreover, a saving is achieved by a combination of heavy equipment in a single geographical location. 2007/The Delta Project: Presentation of the project to the COCOM (Joint Community Commission). 2009: Acquisition of 5 hectares, located on the Boulevard du Triomphe, in exchange of 17,500 m2 of the Edith Cavell Clinic. CHIREC received the promise of €124 million in subsidies, depending on the Brussels Capital Region and the Federal. 2010/The Delta Project: the general programming and implementation of the new hospital building was entrusted to a consortium formed of ASSAR architecture office, offices of special technical studies INGENIUM & SNC Lavalin and stability office GREISCH. "Project" committees, developed by people with a strategic vision covering different sectors such as medical, nursing, pharmacy, technical, logistical and administration, computing, were formed. 2011/ Delta Project: The Delta functional programming is made by new committees with experienced people. Planning permission and environmental permits have been filed with the competent authorities. and the Braine-l'Alleud - Waterloo Hospital with 300 beds. the Basilique Clinic. It will provide qualified medical care in modern infrastructures.